The First World War was unprecedented in the level of destruction and death that was inflicted across the world. Millions were killed or rendered into refugees and buildings, infrastructure, farmland and housing were left in a ruinous state by the impact of the conflict. However, whilst the war brought dislocation and disarray to the lives of many, it also transformed people and brought individuals together who would otherwise have never have met. As a port city, with movements of people and materials throughout the war, Portsmouth is a key site for understanding what was created during the conflict. 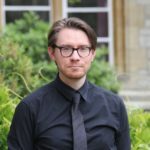 As the centenary of the war is marked, it is useful to consider the ways in which new relationships were created amidst the trauma. The arrival of servicemen and women from the United States in Portsmouth after the declaration of war against Germany by President Woodrow Wilson in April 1917 demonstrates this process. Portsmouth has long been a place where people from all over the world would meet but this process is expanded and accelerated by wartime conditions. 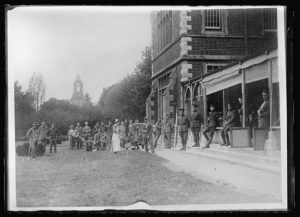 This is especially the case for Americans in Portsmouth as wartime alliances between Britain and the United States ensured a warm welcome as officials put on a range of social events such as dances, concerts and teas. However, this was more than just a one-way process; American visitors brought ideas, practices and values to Portsmouth during the war. The ‘Americanisation’ of Portsmouth had begun even before the major transportation of troops and medical staff from the United States to Europe. Indeed, the news of the entry of the United States into the war had sparked an outbreak of interest in all things American in the city. This can be seen with the celebration of Independence Day on July 4th 1917 outside the Guildhall. Crowds of 10,000 people were recorded in some newspapers as attending the event which had been organised by Mayor Harold R. Pink. The event was held in appreciation of the United States joining the war and a profusion of decorations covered the Guildhall. The two stone lions that adorn the building were brought into the celebration with one covered in the ‘Stars and Stripes’ whilst the other was draped with the Union flag. The celebration of an American national holiday to mark the overthrow of British rule was not regarded as incongruous in the light of wartime needs. Mayor Pink spoke glowingly of a new relationship that could emerge from the conflict. With the reading of a telegram of thanks signed by Vice Admiral William S. Sims of the United States Navy sent by the Embassy in London and the chorus of ‘Three Cheers for America’ shouted by the crowd, the event heralded an interest in all things American in Portsmouth. 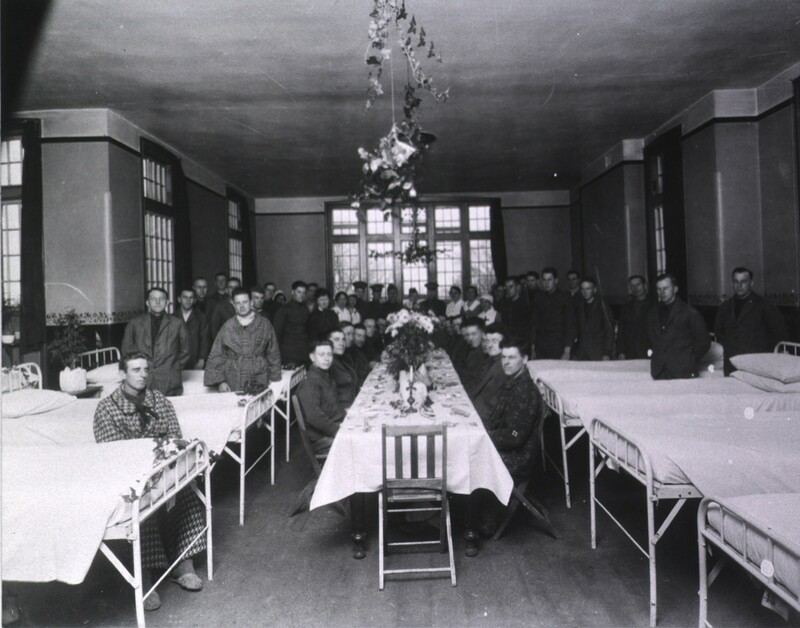 The burgeoning ‘special relationship’ in Portsmouth was supported by the creation of a medical unit in the grounds of the Borough of Portsmouth Mental Hospital. Base Hospital No.33 was organised from nearly 200 men and women serving at the Albany Hospital, Albany, New York in June 1917. A year later, many of these American citizens were assigned to No.33 and treated American troops injured on the Western Front. 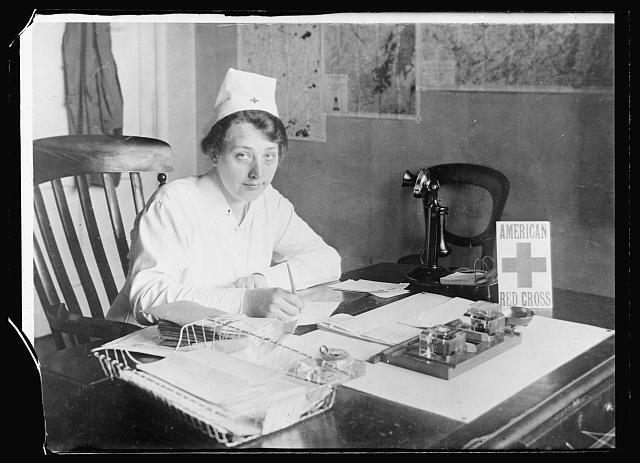 This included individuals such as Mattie Washburn, who was Chief Nurse at No.33 and who was from Fort Ann in upstate New York, who had moved from the hospital in Albany to serve in Portsmouth. With the destruction that the war created, the conflict also brought people to new context and new parts of the world. out for physical exercise and recreation. This game was a highly significant import from the United States as whilst it served as a valuable pastime for troops it was also a means by which a form of soft diplomacy could be conducted in locations like Portsmouth. Charity baseball matches became a common feature in many towns across Britain and acted as a bridge between a foreign military presence and the public. 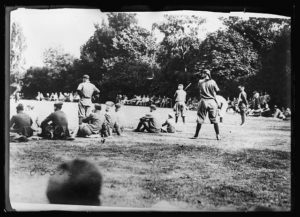 In Portsmouth, the Mayor and Mayoress were the special guests for a baseball game played at Fratton Park on June 1st 1918. The game was styled as the United States Army against Canada and all proceeds were donated to charities across the country. With the development of such strong ties, the celebrations of Independence Day which were held in the Guildhall in July 1918 was remarked upon as residents of Portsmouth making their American allies ‘feel at home’. Another prominent aspect of the presence of the United States within Portsmouth was the American YMCA which was set up in the summer of 1918 on Waltham Street in the city. 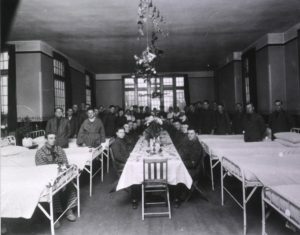 This ‘American home’ for troops provided pastimes and food that would connect soldiers with home. American cigarettes and chewing gum were in supply at the site. Accordingly, this site would act as a connecting point between individuals based in Portsmouth and residents. It was described in accounts as, ‘a medium of introduction to the homes and hearts of English people’. “That’s one thing I will say for the English, they do know how to make tea”. The war transformed local and global contexts but it was a conflict that created as well as it destroyed. Amidst the wreckage of war, we can see how the arrival of Americans in Portsmouth brought people together who would otherwise have remained strangers. By examining these relationships we can create alternative histories of the conflict that can retell the war experience in Portsmouth. Anon, The American Naval Planning Section (London, Washington, DC: Government Printing Office, 1923), 43. “Use of Local Hospitals,” Hampshire Telegraph, Friday 31 May 1918. “Thought for the Wounded,” Hampshire Telegraph Friday 21 June 1918; “Entertainment of American Troop,” Hampshire Telegraph, Friday 16 August 1918. “American Guests,” Hampshire Telegraph, Friday 13 September 1918. Erastus Corning, “Correspondence,” Albany Medical Annals, vol. 39 (1918), 374-375. “U.S. 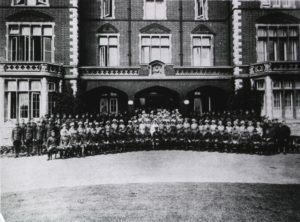 Base Hospital 33,” Hampshire Telegraph, Friday 30 August 1918. “Independence Day at Home,” Hampshire Telegraph, Friday 12 July 1918. “The American Y.M.C.A.,” Hampshire Telegraph, Friday 27 September 1918. “American Preacher at St. Thomas’s,” Hampshire Telegraph, Friday 27 September 1918. “Racy Temperance Speech,” Hampshire Telegraph, Friday 1 November 1918. “American News,” Hampshire Telegraph, Friday 25 October 1918. “An American Greeting,” Hampshire Telegraph, Friday 20 December 1918.